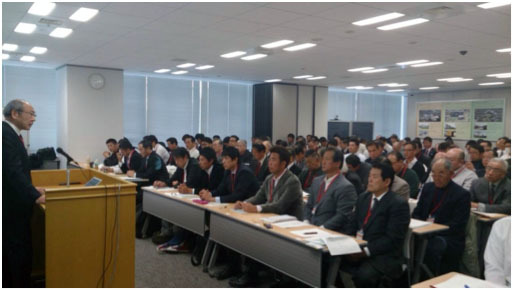 (Tokyo): 125 would-be coaches of high school and college baseball who have played or were involved in Japanese professional baseball went through a two-day induction course by the Japan Student Baseball Association (JSBA) in Tokyo on December 12/13, 2013. They are the first group of 491 applicants who went through similar workshop by the Professional Players’ Alumni Club or those college coaches of ex-professional players with special permit by JSBA. Under the current rules, only those former professional players who hold teaching certificate and taught in high school for 2 years are eligible for coaching high school baseball players. JSBA lecturers emphasized the concept that student baseball is an integral part of education and welfare of students need to be recognized forbidding corporate punishment. 3 more sessions by the JSBA are scheduled for the rest of the applicants within 2013 and new coaching license will be issued in the first quarter of 2013 which will contribute to raise the level of student baseball.